All PR would do is make sure that a majority of voters would have to support it in order for it to take power – a threshold Harper never achieved. ..moved to qs thread. sorry. The Quebec government wants out of the contentious Apuiat wind farm project and has tapped Hydro-Québec to come up with an exit strategy, Radio-Canada has learned. The Apuiat project, first proposed in 2015, is to produce an estimated 200 megawatts annually from about 50 wind turbines on Quebec's North Shore, near the town of Port-Cartier. Backed by the former Liberal government, the $600-million project was highly criticized by the CAQ's François Legault during the election campaign. Société Apuiat, which represents the Innu stakeholders, and Boralex released a joint statement Tuesday, saying they were "disappointed to learn of the government's intention regarding our project" without having had a chance to present it to the new government. The fact that that the government is now expressing its lack of support for the project without having spoken to the Innu promoters yet is unacceptable, said the Chief of the Assembly of First Nations Quebec-Labrador, Ghislain Picard. "The Innu Nation is the promoter of the project — for me, it's important that the promoter isn't left out of such an important decision," he said. For Alain Thibault, the mayor of Port-Cartier, where many of those jobs would land, the CAQ's haste to pull the plug on the project comes as a surprise, after what he thought was a promising meeting with Julien last week. "He really seemed interested in the project. He was asking a lot of questions on why we needed this in Port-Cartier," said Thibault. He said if Apuiat is dropped, the CAQ will have a hard time promoting any new ventures in the region. "Every time he will want to break ground in Nitassinan [the Innu territory], he will have to sit down with them." "The Innu are no longer in a mindset of just receiving annuity from the government," said Société Apuiat in its statement. "On the contrary, Innu want to implement their own investment projects, to build something that is sustainable and renewable, to develop expertise and pride." One of the premier's main arguments against the project during the election campaign was the Hydro-Québec president and CEO Éric Martel's lack of support for the wind farm, made public in a letter last August. The Apuiat project would cost the Crown corporation $1.5 to $2 billion over 25 years, Martel said in that letter. Boralex and Société Apuiat challenge that analysis in their statement, claiming that by the time the wind farm would be up and running in 2022, "the margin of manoeuvre Quebec has in its energy supply will be running out." Tens of thousands of protesters marched through the streets of downtown Montreal on Saturday with hope, desperation and urgency, calling on elected leaders to act now to stop climate change — or they will be held responsible. Desperation because despite all the previous marches and calls on government to act, the planet is still heading toward catastrophe. Urgency because the latest United Nations report on climate change released in October says it’s not vague “future generations,” but today’s pre-teens that will feel the heat and effect as adults. Hope because, well, without hope, what is there? Thousands of people took part in a march for the planet at Place des Festivals in Montreal on Saturday, Nov. 10, 2018. Supporters want Premier François Legault to step up the province's efforts to fight climate change. Tens of thousands of Quebecers took to the streets this weekend to call for more decisive action on climate change. 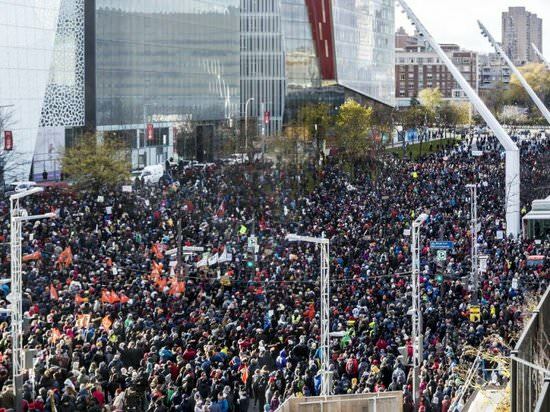 In Montreal alone, 50,000 took part in the demonstration. In the short space of a week, more than 150,000 signed a pledge that commits them to reduce their carbon footprints but also demands more proactive leadership on the issue from governments. Those numbers provide an answer of sorts to those who wondered whether Quebec’s culture of political mobilization had waned along with the sovereignty movement. Some of the activism and the passion that for so many decades attended the debate over the province’s political future has shifted to the environmental front. That shift is not happening in a vacuum. It is already impacting the priorities of the rookie Coalition Avenir Québec government. And it could cost Andrew Scheer’s Conservatives any hope of gains in Canada’s second-largest province in next fall’s federal election. In Quebec, the anti-carbon pricing platform Scheer has been spending the fall shoring up is dead on arrival both in the National Assembly and on the ground. The Legault government has begun its attack on the anglophone community, by forcibly seizing Riverdale high school and displacing its students to other schools, rather than allowing the english and french schoolboards to share the building or to build a new school for the french board. This makes 25 english schools closed since 1998. For reference this is why anglos vote Liberal. The CAQ has also begun asking for religious minority lists from school boards. It is an unfortunate solution, but French-language schools are bursting at the seams downtown and in other central Montréal neighbourhoods: https://www.cbc.ca/news/canada/montreal/condos-villeray-school-1.4413430 That school is in the neighbourhood just north of mine, but there are many in the city centre in areas where few people - and fewer families lived even a decade ago. I don't know if it would be feasable to physically divide Riverdale School. The Legault government is also requesting a headcount of teachers (perhaps other school employees?) who wear religious clothing or signs. I detest the CAQ, but that doesn't excuse voting for the Liberals. We need smaller schools and smaller classes throughout Quebec. And some sharing of buildings by the two linguistic school baords would have been an innovative solution, taking account of the need to consult students and teachers. But this is not a government that believes in democratic school governance. Gregory Kelley, a Liberal MNA and the Opposition critic for issues affecting the anglophone population, said his party is extremely disappointed Riverdale is closing down. "[Roberge] has decided to use a very extraordinary and rare power to close down an English school without consulting teachers parents or the communities on that front," Kelley said. He said the decision disregards the students' perspectives. And that is, yes, why anglos tend to vote Liberal. If QS starts to stand up for minority-langauge education and democracy in school governance, it may get more anglo votes. (It already gets lots among anglo university students, of course.) Until then, it's no shock that a minority community will vote for the only party that appears to be defending them. Good point swallow, I've looked through all the QS social media pages (including the Quebec Solidaire Volunteers Network, which posts in english and tends to discuss anglo community issues) and I haven't found a comment on this. Well, to be accurate, what they're asking for are lists of people who wear religious symbols, including, I would assume, the symbols of the majority religion. Granted, the overall purpose of the proposed ban is probably to lord it over people from minority faiths. Who could be intimidated by a hijab? Or a yumulka or a turban ? Oh, I know...RACISTS. As I said before the election the CAQ are the party of La Meute. Interestingly, Legault does not extend banning religious symbols from the National Assembley where the crucifix hangs. You're either a racist or a hypocrite or both. Quebec’s newly-minted CAQ government managed to catch everyone by surprise when it tabled an immigration bill that includes a plan to throw out 18,000 skilled worker applications made before the CAQ came to power and dating back to 2005. The decision comes amid government plans to introduce a new system of selecting immigrants that prioritizes “Quebec values, the French language, and the needs of the labour market.” The announcement, made just days after Premier Legault said his government would process all skilled worker applications submitted during the previous government’s mandate, has drawn the ire of many who see the decision as short-sighted and unfair to the 50,000-75,000 people who are now left in limbo. The Coalition Avenir Québec government promises to move the crucifix that hangs in the provincial legislature's main chamber if its secularism legislation is adopted into law. The CAQ is set to table a bill today titled, "An act respecting the laicity of the state," which would prohibit public workers in positions of authority from wearing a religious symbol such as a hijab or kippa. A member of the CAQ announced Thursday morning that if the bill passes, the ruling party would introduce a motion to move the crucifix from the National Assembly's main chamber to a different part of the building. I suppose you could reply by saying that the crucifix is the graver affront to secularism, since it purports to symbolize the entire state, whereas civil servants wearing religious clothing are expressing only their own beliefs. And therefore, removing the crucifix should be done independent of whether or not the secular-dress bill passes. And there's also the question as to where exactly in the Assembly they move it. That said, this could probably go some way toward answering critics who accuse the CAQ of double-standards between Catholics and everyone else on the secularization front. Yes, ideally it would be displayed in an educational context, with explanation as to when and why it was hung above the speaker's chair, why it was taken down, and the debate surrounding it. I have never been prouder to be a graduate of the EMSB as I am right now. "This proposed legislation would be contrary to the values the EMSB teaches its children, in particular, values of diversity, acceptance, tolerance and respect for individual rights and religious freedoms," said Julien Feldman, the chair of the EMSB human resources committee. Civil disobediance to resist an unjust law, bravo EMSB. The crucifix would be moved to the National Assembly museum. Already, Montréal is planning to remove its crucifix to what will be a museum area, before the reopening of the City Hall - Council is sitting in a neighbouring building. I do think that is important in terms of secularism and equality of members of any faith or of none. I don't really care how people dress - though I confess that a niqab (face covering, not headscarf) would disturb me as it is a barrier to communication. I would like to point out that there are reasons other than racism to be disturbed by certain religious dress practices, when they are far more restrictive for women than for men. Here, I'm thinking more of some secular (not necessarily atheist) Muslim and Jewish women friends, who see those practices as tombs for women. I'm sure the same might apply to women who have left fundamentalist Christian backgrounds as well, but I don't personally know any. I have met secular women of Hindu backgrounds who feel the same. That said, I think the Anjou councilwoman's statements were contemptuous and disgusting. And beyond stupid. Québec solidaire's Vincent Marissal filed a complaint asking Mignolet to investigate Fitzgibbon's nomination of Guy Leblanc as president and CEO of Investissement Québec, the agency that helps finance businesses across the province. Marissal alleges in his complaint that Fitzgibbon has personal and professional ties with Leblanc. His complaint also claims Fitzgibbon had given instructions to a trust to sell shares he allegedly owned in a company. I haven't heard anything about PR recently. Does it look like Legault might follow through? Do we know if anyone is working up a specific path forward? Are the other parties involved? He said he intended to follow through when asked after the election, but I haven't heard of any committee studying it or bill being introduced. Legault promised to table a bill by next autumn to change the electoral system for the 2022 election to some kind of MMP. Both the PQ and QS have expressed their support. Whether he'll do it or not is not a matter on which I'll be betting cash any time soon. This is the latest media article I recall seeing about the matter. It analyses what the results might be - among other things, it would mean the CAQ shooting itself in the foot. So that's why I'm hanging on to my cash for now. If anyone really insists on a translation, I'll get to it when I have a moment. Meanwhile, try Google Translate. They've given themselves until Oct. 1 to table a bill - and no, I haven't heard of consultation. Committee usually comes after first reading. If we switch to a proportional mixed electoral system in 2022 in Quebec, about one-third of the Coalition avenir Québec (CAQ) members will have to give up their seats. The government of François Legault has committed to tabling a bill by next fall to reform the electoral system, with the support of the Parti Quebecois and Québec solidaire. A noble project, in theory, but one that will have important consequences for many elected officials, in practice. In the Laurentides region, where the CAQ holds the ten electoral districts, a mixed proportional vote would result in the release of four electoral divisions, which would be left to selected candidates on lists. Who would leave? The hon. Member for Groulx and Minister of Finance Eric Girard, the Member of Parliament for Prévost and the Minister responsible for seniors, Marguerite Blais, and the member for Deux-Montagnes and Minister of the Environment, Benoit Charrette? Should Prime Minister François Legault choose instead and ask backbenchers to step down? This is a question that arises because the scenarios already contemplated show that compensatory mixed proportional voting operates region by region. And the CAQ holds all the ridings in several regions of Quebec, such as Mauricie-Bois-Francs or Chaudière-Appalaches. The choices ahead will be heartbreaking, and this is the kind of process that will undeniably sow discord in the caucus of the CAQ. Justice Minister Sonia LeBel, who has the mandate to table a bill by October 1, will not only have the difficult task of convincing her colleagues, but also of facing their anxieties. Talk to former Premier Jean Charest who had to bury a similar project in 2006, when the growl won his caucus. By the admission of Papineau's former Liberal MP Norman MacMillan, big words, and even very big words, came out of his mouth when he learned that in the five ridings of the Outaouais region , two, including his own, would be subject to list candidates. MPs who are dedicated to the election of their party are waiting to keep their jobs and their salaries. Jean Charest understood that, to find peace inside his caucus, it was better to kill the project. The same thing happened in 1978 under René Lévesque. Minister Robert Burns, who presented a green paper on a reform of the voting system, did not make any friends in caucus. His project died when he left politics the following year. The Parti Quebecois would also have difficult decisions to make. Although it supports the reform of the voting system, the PQ should also sacrifice a few ridings in its only stronghold in Bas-Saint-Laurent-Gaspésie. It is half of his caucus that is at stake. Of course, with a compensatory mixed-member proportional vote, the PQ could probably elect list members elsewhere in Quebec, but it would probably lose two out of five in Gaspésie. Once again, who would accept to sacrifice? As one of the experts in the voting system, Professor Emeritus Louis Massicotte, has often explained, those who make the decisions are the current elected representatives, that is, those who have the most to lose. François Legault plays big if he seriously intends to follow up on this project. Not only is he putting his majority at risk, because a compensatory mixed-member system may elicit repeated minority governments, but he will ask his deputation for a strong sense of self-denial. Thank you Unionist. The article was illuminating. I don't want to be pessimistic but it doesn't look good. I do dearly hope this gentleman is found innocent of any attempt to use his office to reward his buddies and line his pockets. Quebec Economy Minister Pierre Fitzgibbon says he has broken no rules and has no intention of resigning in light of the ethic commissioner's probe into the nomination of a friend to the top job at a government agency and the sale of assets in a company he has a stake in. "I will not resign unless I feel that I'm not helping the government," Fitzgibbon told reporters Wednesday. If he ever feels that his presence in the cabinet is detrimental to what Premier François Legault "has in mind to accomplish, I am going to leave in in 30 seconds," he said. "Failing that, I'm going to continue." It's possible he's missing the point, but time will tell. PS: This is not the Beaverton.